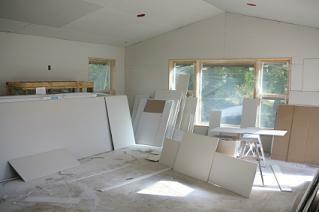 Paperless drywall is a good choice in high-moisture environments. Paperless drywall is relatively new to the building and remodeling markets, but so far, it is said to have many advantages over traditional paper covered drywall. It inhibits mold growth better than paper covered drywall. The higher level of mold resistance is due to the fiberglass facing and backing of the drywall. Once the paper of the drywall is exposed to moisture, it encourages mold growth because the mold feeds off of the wet paper. Once this happens, the mold begins to produce more and more mold spores. Fiberglass is moisture resistant so, no moisture, no mold food. No mold food, no mold growth. The surface is more damage resistant. It does not dent, warp, ripple or buckle as easily as paper covered drywall. No need to install a vapor barrier. If you are installing paper-covered drywall in areas prone to moisture, such as a basement, you must first install a vapor barrier. These barriers are installed before the drywall in order to prevent moisture damage to your walls. Since paperless drywall is resistant to moisture, there is no need to take the extra step in installing a vapor barrier. How Much Does a Sheet of Drywall Weigh? The interior core is made of Gypsum - Gypsum is a naturally occurring mineral, though many commercially produced Gypsum boards are made of synthetic Gypsum. The interior core is non-combustible - Gypsum is a natural fire retardant. The outside paper will, of course, burn, but the interior core or Gypsum board releases steam when it comes in contact with fire. This does not mean that it is fireproof and most Gypsum boards' fire retardant qualities are rated at a level between one to four hours. Paper-backed drywall is more prone to mold than paperless - If the paper covered drywall is exposed to moisture, the paper acts like food for mold. Paper-backed drywall is made almost entirely out of recycled materials - The paper is made from recycled newspapers. For some manufacturers, synthetic Gypsum board is produced from the negative byproducts of other manufacturing plants such as paint manufacturing plants. No need for use of special tools or fasteners during installation. More resistant to dents, dings, warping and buckling. No need to install vapor barrier. Perfect for moisture-prone areas like basements and bathrooms. Fiberglass particles tend to irritate skin, nose, eyes and throat during installation. Not as easy to repair damaged boards. Extra skim coat of joint compound is often needed to smooth out the rough fiberglass surface on the finished wall side. Smooth finished wall side requires no additional skim coating. Easy to repair and patch holes or other damage. Does not inhibit mold growth as well. More prone to dents, dings, warping and buckling. Vapor barrier is necessary for installations in moist areas such as basements and paper covered drywall known as "green" board is necessary for installation in moisture-prone areas like bathrooms or laundry rooms. Since paperless drywall has really only been widely used for the past two or so years, long-term results on the product are not in yet. Deciding on which type of drywall you are going to use is really a matter of personal choice, not to mention how much you are willing to spend. So, look at the pros and cons closely and do a little research of your own before making a final decision.